Since crop nutrition has a major influence on economic returns, Incitec Pivot Fertilisers is continuing nutrition trials in canola to help growers fine-tune their fertiliser programs. One such trial last year gave some significant insights into best management practices for managing sulphur in canola. Canola has long been described as having a much higher requirement for sulphur than wheat or legume crops. Sulphur is essential for oil and protein synthesis in canola, as well as chlorophyll formation in leaves and therefore plant growth. Sulphur response trials through the late 1980s and 1990s demonstrated potential yield and oil penalties in the order of 50% and 10% respectively in canola crops deficient in sulphur (Hocking et al, 1996). Previous advice for managing fertilisers in canola has been to apply a base level of 20 kg/ha of sulphur (30 kg/ha on lighter soils) to all paddocks and adjust nitrogen applications based on the season (Parker, 2009). This blanket approach has been questioned in recent years for a variety of reasons. 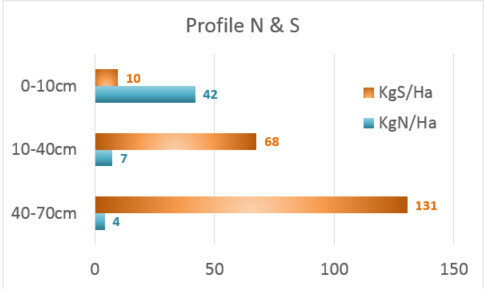 Few canola trials have provided consistent yield responses to sulphur in recent research, while nitrogen responses are common and widespread. Depleted nitrogen and increasing sulphur reserves with depth are arguably the norm rather than the exception. There has been an increased use of sulphur fortified compound fertilisers and gypsum for soil amelioration, resulting in higher residual sulphur levels in some soils. Sulphur removal from canola grain is considerably lower than the 10 kg of sulphur per tonne of grain often quoted in older management guides. It is closer to 4 or 5 kg of sulphur per tonne of grain. Transient sulphur deficiency and low early plant tissue tests do not necessarily translate into reduced yield, if canola root systems develop and access sulphur deeper in the soil profile. Source: Adapted from Parker, 2009; Norton, 2016 and Brennan, 2018. Hay cuts taken at soft dough (wheat) or early flowering (canola). Our work at this trial site began with assessing starting soil sulphur and nitrogen levels. Available sulphur and nitrogen levels are often lower following a wet, high yielding year, due to higher nutrient removal in grain, baling or burning to reduce stubble loads, leaching and other soil losses. Summer rainfall also created conditions conducive to the mineralisation of nitrogen and sulphur. Both nutrients have a high mobility and leaching of nitrate nitrogen and sulphate sulphur down the profile was expected in this lighter textured soil. On very sandy soils, sulphate can be leached from the root zone and leave young crops deficient, especially after heavy rain. It can also be stratified down the profile, retained in clay subsoils and native gypsum layers. Ideally, we were looking for a trial site with low soil sulphur levels, but this proved elusive. The soil test results were typical of many soils in the region. See Figure 1. Source: Nutrient Advantage laboratory, April 2017. Sampled 21 April 2017. Soil cores (0-40 cm) showing brown sand over yellow clay loam. The soil type was a brown sand (CEC 3.7), overlaying a yellow clay loam at 25 to 40 cm depth. The organic carbon content in the soil was relatively low at 0.76%, which would reduce the potential for mineralisation of sulphur and nitrogen. In the top 0-10 cm of soil, there was only 10 kg/ha of plant available sulphur (6.4 mg/kg KCl-40). Mineral nitrogen (a combination of nitrate and ammonium nitrogen) was above 40 kg/ha of nitrogen. There was virtually no nitrogen deeper in the soil, with only 11 kg/ha of nitrogen in the 10-70 cm zone. In contrast, sulphur increased with depth, with 68 kg/ha of sulphur in the 10-40 cm zone and 131 kg/ha of sulphur at 40-70 cm depth. Granulock® Z was drilled in the seed row at planting, supplying 11 kg/ha of nitrogen and 4 kg/ha of sulphur – enough to get the crop established. The canola grown in the trial was ATR Stingray, late sown into moisture on 20 May 2017. The question was, would more sulphur be needed to optimise growth and yields? The critical sulphur test value for canola from New South Wales data is 8.6 mg/kg of sulphur in the top 15 cm, with a critical range of 4.8-15 mg/kg. As it turned out, there were no obvious visual sulphur deficiency symptoms in the crop. Tissue tests taken at the 4 to 6 leaf stage confirmed that sulphur levels were adequate. Nitrogen was applied at rates of 0, 25, 50, 75, 100, 125 and 150 kg/ha of nitrogen, either as single applications or split between 4 leaf, 8 leaf and early flowering stages. At the 75 kg/ha of nitrogen rate, an additional 30 kg/ha of sulphur applied as a Gran-Am® urea blend provided no yield or oil benefit compared with nitrogen alone. Figure 2: Yield and oil responses to applied nitrogen and sulphur in ATR Stingray at Sherwood SA, 2017. With nitrogen, it was a different story entirely. The crop showed an almost insatiable appetite for nitrogen fertiliser. It soon developed severe nitrogen deficiency symptoms and we saw large dry matter responses from topdressed nitrogen at rates of 50 kg/ha of nitrogen and above. With 25 kg/ha of applied nitrogen, plants were still pale green and showing lower leaf yellowing. 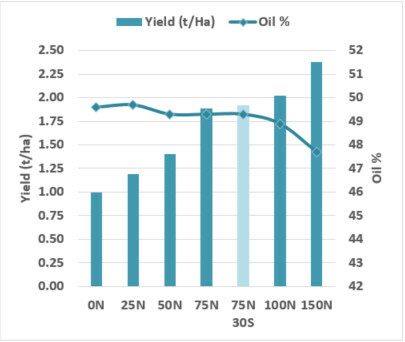 Yields increased from 1 t/ha with starter fertiliser only to 2 t/ha with an additional 100 kg/ha of applied nitrogen and nearly 2.4 t/ha with 150 kg/ha of applied nitrogen. The value of segmented soil testing to rooting depth is clear in this example. Would you spend up big on sulphur fertilisers with that pool of available sulphur ready and waiting? No two seasons are the same and no two paddocks are the same, but you don’t know unless you test. Best practice sulphur nutrition relies on an understanding of how much sulphate sulphur is in the soil bank, both in the topsoil and at depth. Without knowing the background nutrient levels from soil test results, growers are flying blind with their fertiliser requirements for sulphur. But with this knowledge, sulphur can be managed in a similar way as nitrogen. Just like nitrogen, apply sufficient sulphur at seeding to establish the crop and then top it up as the season and crop demands. Consider a compound fertiliser such as Granulock SS, with 10% nitrogen, 17.5% phosphorus and 12% sulphur. This includes 4% sulphate sulphur and 8% ultra-fine elemental sulphur. Also, ensuring an adequate supply of early nitrogen can encourage more rapid cabbaging and root development, helping crops access any deeper sulphur reserves. Then monitor crops pre-budding and make an assessment about whether additional sulphur is required. Sulphur deficiency in canola can be corrected in crop with no yield penalty, provided you act before stem elongation. Gran-Am or Gran-Am urea blends are highly effective at topping up nitrogen and sulphur. Gran-Am contains sulphur in the readily-available sulphate form. This approach ensures that fertiliser dollars are spent where they can provide the best return. In some cases, like this one, it will mean a reallocation of the fertiliser budget towards nitrogen, the key driver to reaching target yields. Of course, it is also important to replace sulphur removal across the cropping rotation. In this trial, grain testing was used to measure the removal of sulphur, with the most removed being 9.1 kg/ha of sulphur where the crop yielded 2.38 t/ha. Grain testing can be a useful tool for growers to identify the nutrients removed in grain each year and is available from the Nutrient Advantage® laboratory. For more information on this trial or to discuss sulphur or nitrogen nutrition in canola further, please contact me on 0407 342 103 or craig.farlow@incitecpivot.com.au.